Hello lovelies! A few months ago, back in December, I took some time to attend Yoga by Candace’s (YBC) Business of Yoga training. This training was the extra boost in knowledge, drive, community, and fire that I needed to really begin thinking about Yoga by Paige as a business rather than just an individual offering yoga classes. During that training we covered so many topics and no questions were off limits. I am forever grateful to Candace for sharing her journey and giving us a peek behind the scenes of her world. Going into the training, my goals were to learn more about diversifying revenue streams, how to build a larger community, and to learn how to pitch companies for collaborations. Since December, I’ve pulled out all stops and have been treating Yoga by Paige, LLC as a proper business entity by creating more content than ever, a few of these include: value providing Instagram posts, quality blog posts, sharing favorite products, and yoga flows on YouTube. Needless to say, all of this has kept me pretty darn busy! Comes with an info card. On one side, you will see all the information about each product. On the other side, you will receive a mantra message from Candace that explains the thought process and inspiration behind the selection of items. The box contains 7-11 items from the health and wellness spheres, with an emphasis on small businesses. People likely will not find these products at their local big box stores. To keep it small business friendly, they only have 150 boxes available for pre-order. They sell out every time, so hurry and order yours now! Use code: FRESH20 to save 20% off your first order! 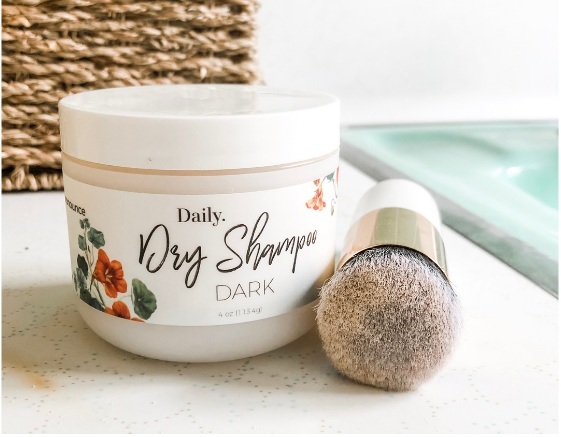 I’m already obsessed with this Daily Dry Shampoo (game changer, ladies!!). I’m a huge dry shampoo connoisseur and can’t tell you enough how well this works. The brush applicator allows for targeted placement, it smells great and is entirely vegan. Once you try this powdered version, you won’t go back to your other brands. I used the Halsa Essentials Asana Flow essential oil during my classes last week to provide a bit of uplifting energy through aromatherapy. Norcal has has quite the rainy winter and the bright citrus in this essential oil roll-on was exactly what we all needed to remember that warmer weather is on the way. The other item in this self-care box that really caught my eye is the Restore Hemp lotion by BodyChek to help recovery after all the Coachella workouts I’m putting myself through. 😅 This one has a light peppermint scent that leaves the feel skin feeling cool and slightly tingly. If you haven’t yet tried a CBD lotion, I definitely recommend it. I’ve tried a few brands and they really do reduce soreness and allow the body to recover more quickly. I liken it to a topical and natural version of ibuprofen. If you’re into the discovery box world, I highly recommend checking out the YBC Mantra Box®, the products are high quality and intentionally gathered from small businesses. I’ve loved discovering everything in mine and look forward to next quarter’s. Be sure to sign up today before they sell out! Click here to reserve your Mantra Box today! Yoga by Paige, LLC was founded as a means to help other people become the best version of themselves. We empower our students through weekly classroom offerings, workshops, retreats, regular blog content and YouTube videos. Subscribe to receive updates, free online yoga classes, access to exclusive deals, and more. Thank you for you joining our community!